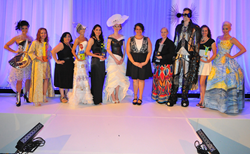 Trash 2 Trends 2016 winning designers pose with their recycled fashion creations. Credit: TK Photography. We have to make a change to the way we discard our unwanted items, and Trash 2 Trends is a perfect example of what the future of trash can be! American Textile Recycling Service (ATRS) was proud to be a diamond sponsor of last Saturday's Trash 2 Trends event, hosted at SeaWorld's Ports of Call. Saturday evening marked the third successful celebration of this annual eclectic runway show, featuring designs fabricated from throwaway items that would otherwise go to Orlando's landfill. Talented fashion designers from Central Florida came together to showcase their recycled creations and competed for top honors at this annual Evening of Recycled Fashion. The Best Overall Design was made from recycled paper and bicycle inner tubes. Other innovative materials included recycled globe maps, Chinese takeout containers, used yoga mats and inflatable pool toys. The impressive upcycling creativity demonstrated on the runway served as a challenge for those in the audience to be more mindful of ways to reuse and repurpose their "trash". "Trash 2 Trends 2016 was the best year yet!" said Jody Buyas, Keep Orlando Beautiful Coordinator. "The designers really stepped up and stretched their use of materials to create a stellar runway show. Thank you to SeaWorld Orlando and all of our amazing partners." Trash 2 Trends is more than just a spectacular highlight of creative recycling and upcycling by Orlando's gifted fashion designers. The event is also a fundraiser to support local planet-friendly services provided by Keep Orlando Beautiful. Organized in conjunction with the city, the green carpet event helps bring awareness to Orlando's ambitious goal of a 50% residential waste diversion rate by 2018 - and 100% by 2040. "I was just amazed at the creativity of these designers," said Daisy Morales, the Orange County Soil and Water Conservation District 2 Supervisor, who was in attendance at the event. "The amount of recycled material they were able to use was very inspiring. I wish we had more events like this to share sustainability messages with the community. We have to make a change to the way we discard our unwanted items, and Trash 2 Trends is a perfect example of what the future of trash can be!" The fashion designers highlighted on the runway last weekend are not the only Floridians capable of impacting our communities. All residents can support the City of Orlando's sustainability goals by donating gently used, unwanted clothing, shoes, soft toys and other household textiles all year round. ATRS operates hundreds of signature orange Clothing & Shoe Donation bins all throughout the greater metropolitan area. These bins are an easy, convenient one-stop drop off for all unwanted textiles. Residents can find their nearest donation bin by calling the 24 Hr Hotline at 866-900-9308 or visiting http://www.atrscorp.com. American Textile Recycling Service (ATRS) is the nation’s fastest growing textile recycler. Its socially responsible business model provides free textile recycling solutions for the public, job stimulation worldwide and much-needed funding for worthy local charities. Easy, convenient ATRS Donation Bins are available throughout Colorado, Texas, Florida, Michigan, Tennessee, Atlanta, Oklahoma, Arizona, Indiana and Southern California. ATRS is committed to keeping textile waste from local landfills and promoting a greener tomorrow. For press inquires contact pr (at) atrsonline (dot) com.